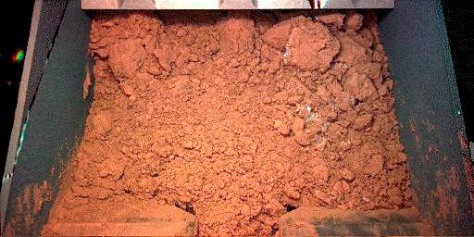 A photograph taken by NASA's Phoenix Mars Lander shows Martian soil within the scoop on the end of the probe's robotic arm. Scientists speculate that the white patches on the right side of the image could be ice or salts that precipitated into the soil. The color was acquired by illuminating the scoop with red, green, and blue light-emitting diodes.